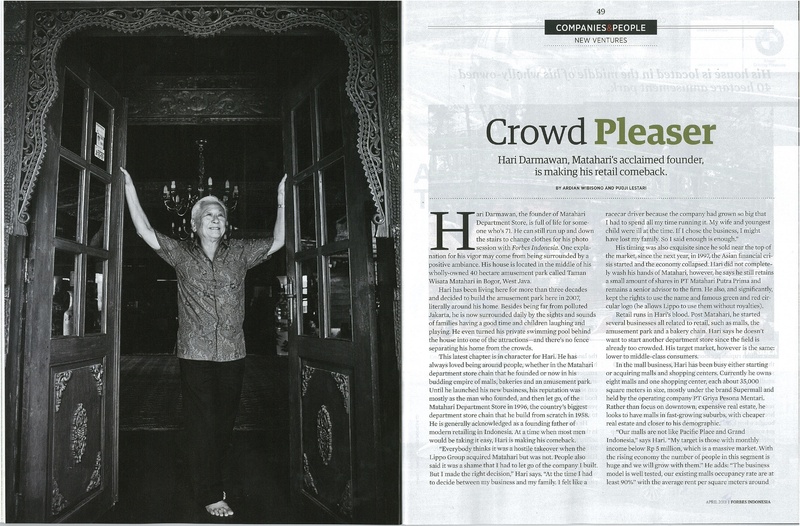 Hari Darmawan, the founder of Matahari Department Store, is full of life for someone who’s 71. He can still run up and down the stairs to change clothes for his photo session with Forbes Indonesia. One explanation for his vigor may come from being surrounded by a positive ambiance. His house is located in the middle of his wholly-owned 40 hectares amusement park called Taman Wisata Matahari in Bogor, West Java. Hari open his door house for everyone. 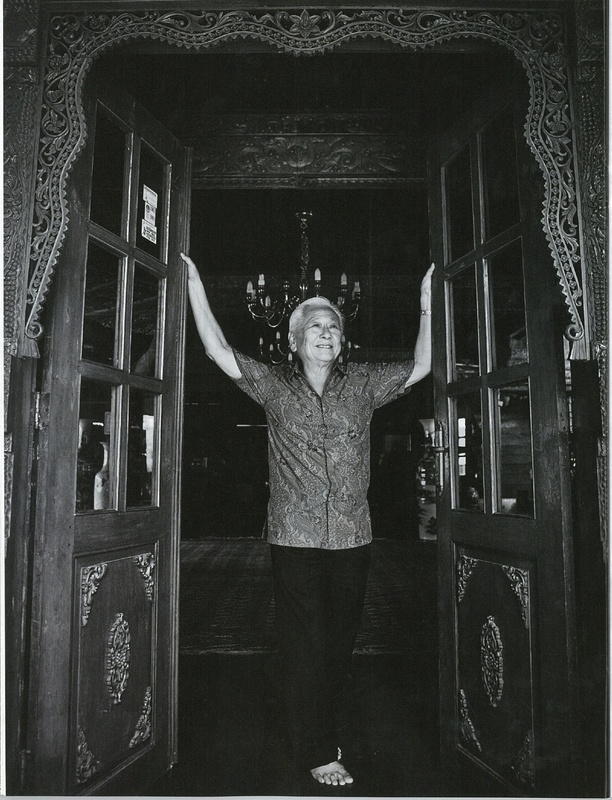 His house is a traditional Javanese style, wood engraved from the outside to the inside, and some part of the upper living room area are decorated with Balinese style engraved. Hari has been living here for more than three decades and decided to build the amusement park here in 2007, literally around his home. Besides being far from polluted Jakarta, he is now surrounded daily by the sights and sounds of families having a good time and children laughing and playing. He even turned his private swimming pool behind the house into one of the attractions—and there’s no fence separating his home from the crowds. This latest chapter is in character for Hari. He has always loved being around people, whether in the Matahari department store chain that he founded or now in his budding empire of malls, bakeries and an amusement park. Until he launched his new business, his reputation was mostly as the man who founded, and then let go, of the Matahari Department Store in 1996, the country’s biggest department store chain that he build from scratch in 1958. He is generally acknowledged as a founding father of modern retailing in Indonesia. At a time when most men would be taking it easy, Hari is making his comeback. His timing was also exquisite since he sold near the top of the market, since the next year, in 1997, the Asian financial crisis started and the economy collapsed. Hari did not completely wash his hands of Matahari, however, he says he still retains a small amount of shares in PT Matahari Putra Prima and remains a senior advisor to the firm. He also, and significantly, kept the rights to use the name and famous green and red circular logo (he allows Lippo to use them without royalties). Retail runs in Hari’s blood. Post Matahari, he started several businesses all related to retails, such as malls, the amusement park and a bakery chain. Hari says he doesn’t want to start another department store since the field is already too crowded. His target market, however is the same: lower to middle-class consumers. In the mall business, Hari has been busy either starting or acquiring malls and shopping centers. Currently he owns eight malls and one shopping center, each about 35,000 square meters in size, mostly under the brand Supermall and held by the operating company PT Griya Pesona Mentari. Rather than focus on downtown, expensive real estate, he looks to have malls in fast-growing suburbs, with cheaper real estate and closer to his demographic. “Our mall is not like Pacific Place and Grand Indonesia,” says Hari. “My target is those with monthly income below Rp 5 million, which is a massive market. With the rising economy the number of people in this segment is huge and we will grow with them.” He adds: “The business model is well tested, our existing malls occupancy rate are at least 90%” with the average rent per square meters around a million rupiah per month. Hari also plans to develop the business by building smaller malls, around just 10,000 square meters. This year he is going to build two such smaller malls in Makassar and Ambon, the latter named the Maluku City Mall. 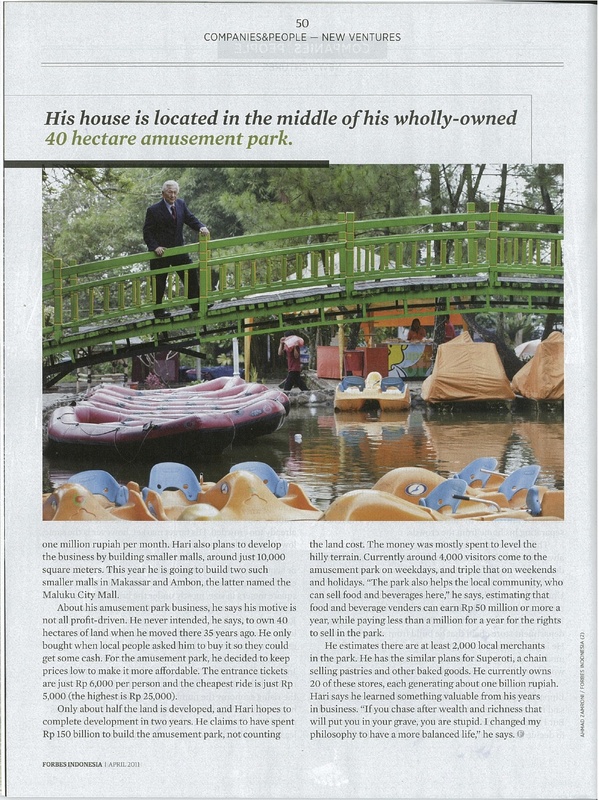 About his amusement park business, he says his motive is not all profit-driven. He never intended, he says, to own 40 hectares of land when he moved there 35 years ago. He only bought when local people asked him to buy it so they could get some cash. For the amusement park, he decided to keep prices low to make it more affordable. The entrance tickets are just Rp 6,000 per person and the cheapest ride is just Rp 5,000 (the highest is Rp 25,000). Only about half the land is developed, and Hari hopes to complete development in two years. 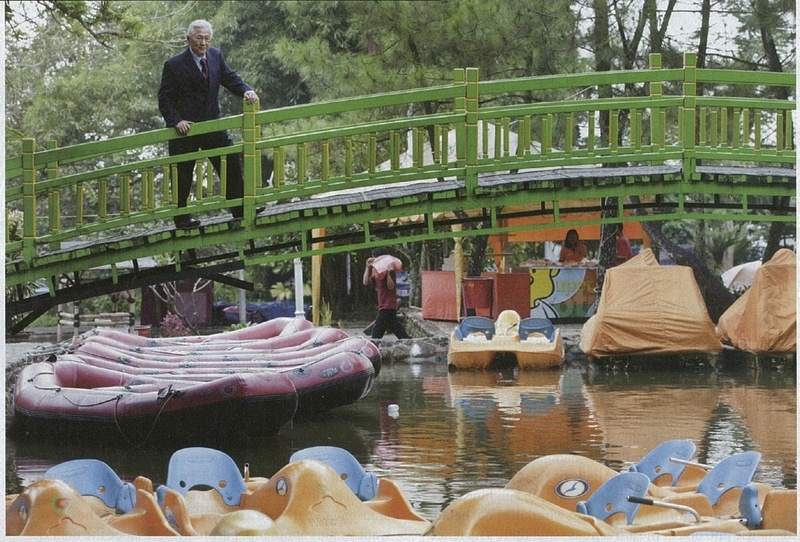 He claims to have spent Rp 150 billion to build the amusement park, not counting the land cost. The money was mostly spent mostly to level the hilly terrain. Currently around 4,000 visitors come to the amusement park on weekdays, and triple that on weekends and holidays. “The park also helps the local community, who can sell food and beverages here,” he says, estimating that food and beverage venders can earn Rp 50 million or more a year, while paying less than a million for a year for the rights to sell in the park. He estimates there are at least 2,000 local merchants in the park. He has the similar plans for Superoti, a chain selling pastries and other bake goods. He currently owns 20 of these stores, each generating about one billion rupiah. Hari says he learned something valuable from his years in business. “If you chase after wealth and richness that will put you in your grave, you are stupid. I changed my philosophy to have a more balanced life,” he says. This entry was posted in Companies, People, Publications and tagged Griya Pesona Mentari, Hari Darmawan, Lippo Group, Maluku City Mall, Matahari Department Store, Matahari Putra Prima, Supermall, Superoti, Taman Wisata Matahari by Pudji Lestari. Bookmark the permalink.